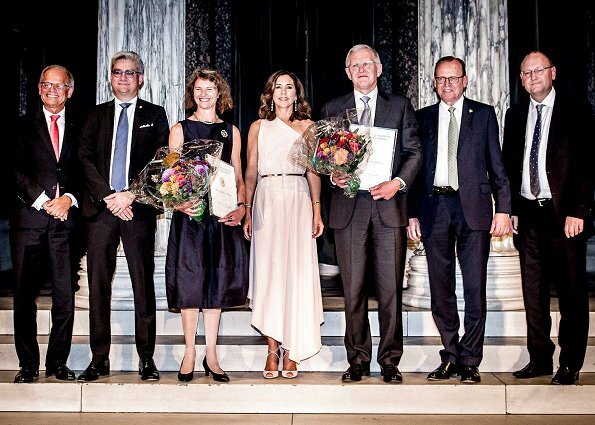 On September 3, 2017, Crown Princess Mary of Denmark presented the Carlsberg Foundation research prize to Professor Karl Anker Joergensen and Professor Mette Birkedal Bruun with a ceremony held at the Glyptotek in Copenhagen. 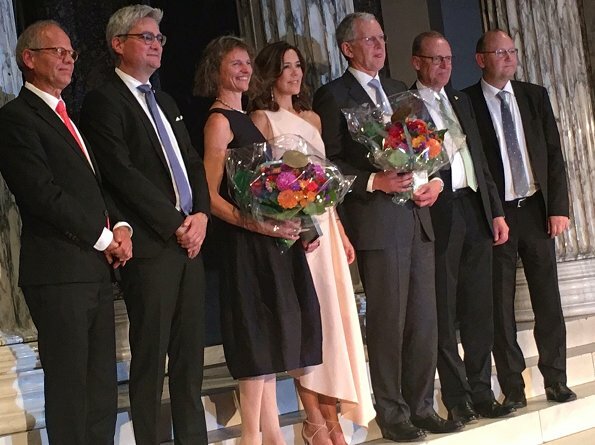 Joergensen received the prize for his research in homogeneous catalysis and Bruun for her studies in the medieval monk institution. 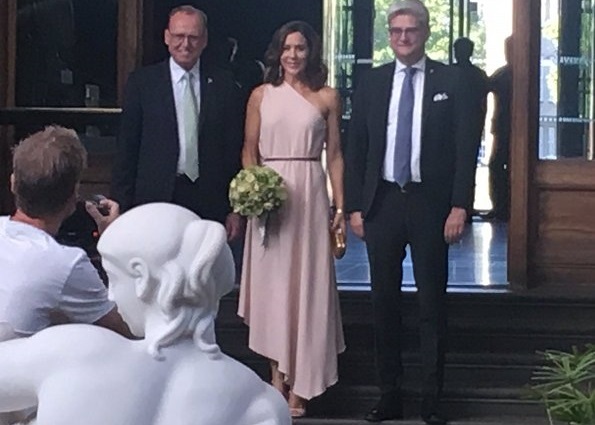 Crown Princess wore a blush color one-shoulder gown of Charlie series of Stella McCartney. She's amazing! Nonstop duties these days and looking just right each time. I love this clean-lined asymmetrical dress in this fresh color with her dark hair. Shoes are fab. Wow, a very different look for her, love the dress and shoes, would have preferred her hair to be less fussy around the face but overall a striking and fresh look. She looks lovely, the dress and color looks good on her, her hair is beautiful too. Frederick has been in Australia competing in a yacht race. He was refused entry into a bar because he didn't have identification him. Unbelievable isn't it? I read that Frederik is in Nevada USA attending the burning man event!! For those of you who haven't heard of it take a look!!! Oh dear, I may be in the minority, but this is a miss for me. In my opinion, she looks like she is on her way to a college toga party, dressed in a bed sheet. Like the dress! Lovely colour and clever symmetry between shoulder and hem. I want to outstanding the simplicity of this outfit, which gives it its elegance. Hair, earrings and shoes match very well with the outfit, this is another reason of her elegance apart from the dress itself and her broad. She looks lovely. The colour is beautiful and the asymmetrical draping of the dress is very elegant and flattering. The simplicity of the dress means she can wear those more ornate shoes and it not be too much. She is always a beauty but this is especially "wow"! Lovely, and very well chosen complements!!! Lovely, particularly love the shoes!